The Grill, 11th Floor, Grand Hyatt Hotel, 1 Harbour Road, Wan Chai, Hong Kong. +852 2584 7722 Poolside restaurant open for lunch and dinner, weather permitting. Mon to Fri A La Carte Menu 11.30am-6pm. Barbecue Dinner Buffet 6.30pm-10pm. Sat & Sun Brunch 12 noon-3pm. A La Carte Menu 3pm-6pm. Barbecue Dinner Buffet 6.30pm-10pm. 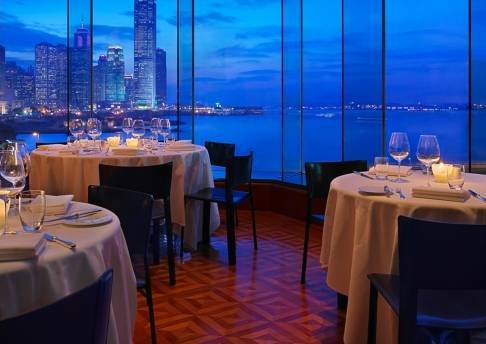 One Harbour Road Restaurant, 7th and 8th floors, Grand Hyatt Hotel, 1 Harbour Road, Hong Kong. +852 2584 7722. Commanding unparalleled views of Hong Kong's famous Victoria Harbour, this duplex restaurant at Grand Hyatt Hong Kong emulates the elegance of a high society, 1930's-era Chinese mansion. Mon to Sat Lunch 12 noon-2.30pm. Dinner 6.30 pm-10.30 pm. Sun Lunch 11.30am-2.30pm. Dinner 6.30pm-10.30pm. 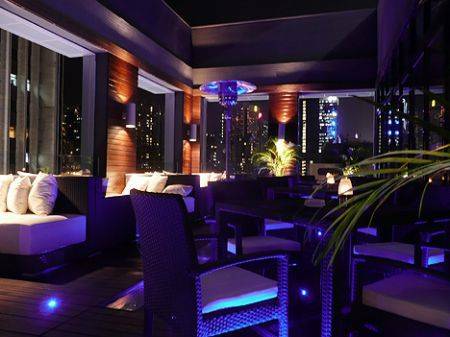 Wooloomooloo Roof Top Bar, 31st Floor, The Hennessy, 256 Hennessy Road, Wan Chai, Hong Kong. +85 2893 6960. 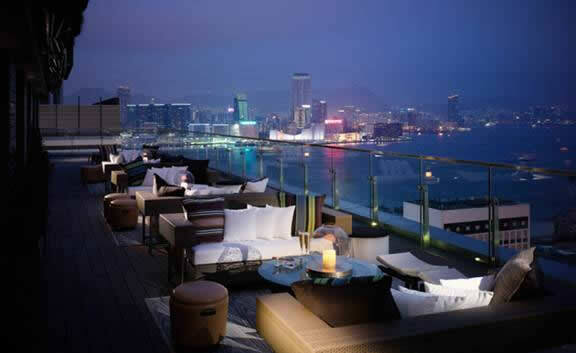 You get a stunning panoramic view of Causeway Bay and Happy Valley from the open air roof terrace. 31st floor and rooftop. 1.45pm till late. Red Almond, Shop 1402, 14th floor, Hysan Place, 500 Hennessy Rd, Causeway Bay, Hong Kong. +852 2155 2872. The restaurant offers a muted yet still interesting skyline of the Happy Valley neighbourhood. Mon to Sun 12 noon-11pm. VIEW 62, 62th Floor, Hopewell Center, 183 Queen's Road East, Wan Chai, Hong Kong. +852 2574 6262. +852 2862 6166. At this revolving restaurant take the elevator from the 17th floor and you are really in for an experience: it is built outside of the building and the view is really amazing. 10 minute walk from the MTR Wan Chai station (go south from the MTR station). 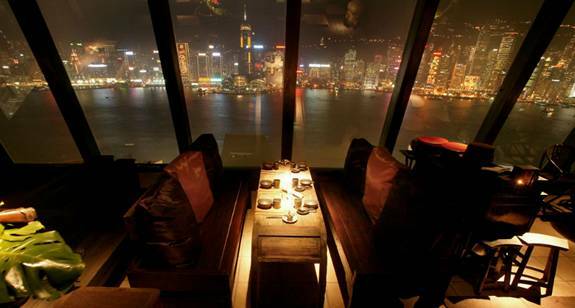 R66 Revolving Restaurant, 62nd floor, Hopewell Centre, 183 Queen's Road East, Wan Chai, Hong Kong. +852 2862 6166. 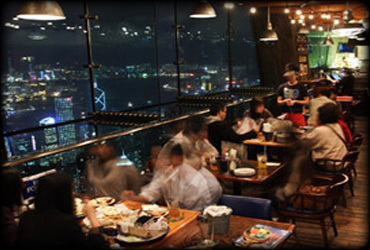 W28 Steak House, 9th floor, Hopewell Centre, 183 Queen's Road East, Wan Chai, Hong Kong. La Cucina Italiana, 21st 22nd floor, Hopewell Centre, 183 Queen's Road East, Wan Chai, Hong Kong. Espuma, 25th floor, Hopewell Centre, 183 Queen's Road East, Wan Chai, Hong Kong. Waterside Terrace, 8th floor, Island Shangri La, Pacific Place, Supreme Court Rd, Central, Hong Kong. +852 2877 3838 Open 11am-11pm (last order at 10.30pm). The Pawn Roof Garden, 3rd floor, 62 Johnston Road, Wan Chai, Hong Kong. +852 2866 3444. Level 5, JW Marriott Hotel, Pacific Place, 88 Queensway, Hong Kong. +852 2810 8366. Club@28 Bar, 28th floor, Crowne Plaza Hotel, 8 Leighton Rd, Causeway Bay, Hong Kong, China. 1800 007 697 A chic bar located adjacent to the stunning swimming pool on the roof top terrace. Unwind with a drink in hand and some tasty bar food after work with friends, or end an evening gazing out over the city views. Kung Tak Lam, 10th floor, World Trade Center, 280 Gloucester Rd, Hong Kong. +852 2881 9966 A delightful vegetarian restaurant serving Shanghainese cuisine. Hotpot, dim sum and noodles dishes are made with MSG free ingredients. Caprice Restaurant, 6th floor, Four Seasons, 8 Finance Street, Central, Hong Kong, China. +852 3196 8860 With superb views over Victoria Harbour and the Kowloon Peninsula. Lunch 12 noon-2.30pm. Dinner 6pm-10.30pm. Lung King Heen (View of the Dragon), 4th floor, Four Seasons, 8 Finance Street, Central Hong Kong, China. Spectacular harbour views. +852 2805 0600 Lunch Mon to Sat 12 noon-2.30pm. Sundays and Pub Hol 11.30am-3pm. Dinner daily 6pm-10.30pm. Sevva, 25th floor, Prince's Building, 10 Chater Road, Central Hong Kong. +852 2537 1388. 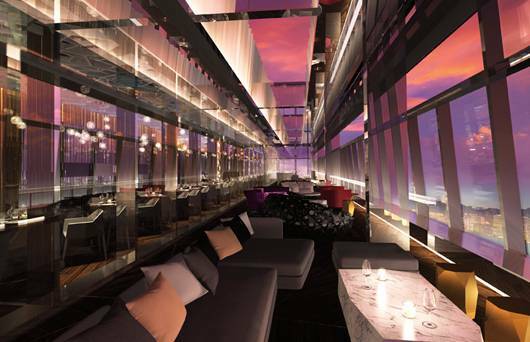 The rooftop Sevva Terrace commands prime 360 degees views of the Hong Kong harbour. View the fireworks and 'Symphony of Lights' Laser Show. Lily, 6th floor, 33 Wyndham Street, 6th Floor, LKF Tower, Hong Kong. +852 2810 6166 Primarily a lounge. Bloom, 5th floor, 33 Wyndham Street, 6th Floor, LKF Tower, Hong Kong. +852 2810 6166. Restaurant and raw bar. Pier 7 Rooftop Cafe and Bar, Shop M, Roof Viewing Deck, Central Pier 7, Star Ferry, Central, Hong Kong. +852. 2167 8377 On top floor directly above central pier 7 (Ferry to Kowloon). Bubba Gump Shrimp Co Restaurant, Level 3, Shop 304 & 305, Level 3, The Peak Tower, 128 Peak Road, The Peak, Hong Kong. +852 2849 2867 Sun to Thurs 10am-11pm. Fri, Sat & Public Holidays 10am-12 midnight. Pearl on the Peak, Shop 2, Level 1, The Peak Tower, 128 Peak Road, Hong Kong. +852 2849 5123 Daily and Pub Hols 12 noon-2.30pm. 6pm-10.30pm. Overlooks Hong Kong. Tien Yi, 206 and 306, 2nd and 3rd floors, The Peak Tower, The Peak Tower, 128 Peak Road, Hong Kong. +852 2907 3888 Mon to Fri 11am to 11pm. Sat, Sun & Pub Hols 10am to 11pm. Harbour views. Kyo Hachi, Shop 205, Level 2, The Peak Tower, 128 Peak Road, Hong Kong. +852 2907 2888 Daily 11.30am -11pm. The Peak Lookout, 121 Peak Rd, The Peak, Hong Kong. +852 2849 1000 Mon to Fri 10.30am-11.30pm. W/ends Breakfast 8.30am-11am and P/Hs. Mövenpick Marche, 6th and 7th floors, The Peak Tower, 128 Peak Road, Hong Kong. +852 2849 2000. Hong Kong view as you eat! Best view of the city. The Peak Tower is above the Peak Tram Terminus. Stunning scenery! Buffet style over two floors. Cafe 103, Level 103, Ritz-Carlton Hong Kong, International Commerce Centre, 1 Austin Road West, Kowloon, Hong Kong. +852 2263 2263 Daily 12 noon-10.30 pm. Mon to Sat and Publ Hols Chocolate Afternoon Tea 3pm-6pm. Sunday Chocolate Afternoon Tea 2pm-9pm. Mon to Sat Lunch Buffet 12 noon-2pm. Mon to Sat Dinner Buffet 6.30pm-10pm. 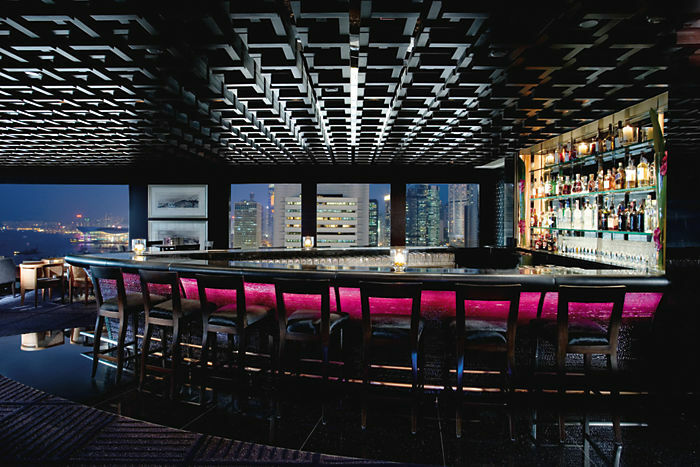 Tosca, Level 102, Ritz-Carlton Hong Kong, International Commerce Centre, 1 Austin Road West, Kowloon, Hong Kong. +852 2263 2263 Mon to Sat Lunch 12 noon-2.30pm. Dinner 6pm-10.30pm. Sunday Brunch 11.30am-3pm. Southern Italian. Semi formal. Club Lounge, Level 116, Ritz-Carlton Hong Kong , International Commerce Centre, 1 Austin Road West, Kowloon, Hong Kong. +852 2263 2263 Club floor guests. Spectacular and panoramic views of the city and Victoria Harbour. Dragon Seal Chinese Restaurant, 101st floor, International Commerce Centre, 1 Austin Rd West, Kowloon. +852 2568 9886 Like sitting on top of the world. 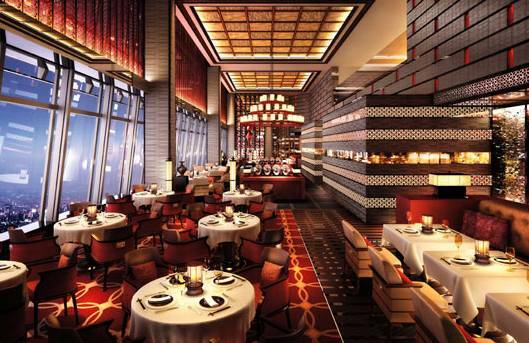 An elevator is reserved for the exclusive use of restaurant patrons, and the ride up 101 floors is smooth and fast. Above Kowloon Station and Elements shopping mall. Kitchen, W Hotel Hong Kong, 1 Austin Road West, Kowloon Station, Kowloon, Hong Kong. +852 3717 2222. Stunning harbour view. Daily 6.30am-11pm. Starwood. Angelini, Kowloon Shangri-La, 64 Mody Road, Tsim ShaTsui East, Hong Kong. +852 2733 8750 Lunch 12 noon-3pm. Dinner 6.30pm-11pm. Bubble La Villa 37, 37th floor, Era Tower, 393 Jaffe Rd, Causeway Bay, Hong Kong. +852 2724 0707 With a 360 degrees view. 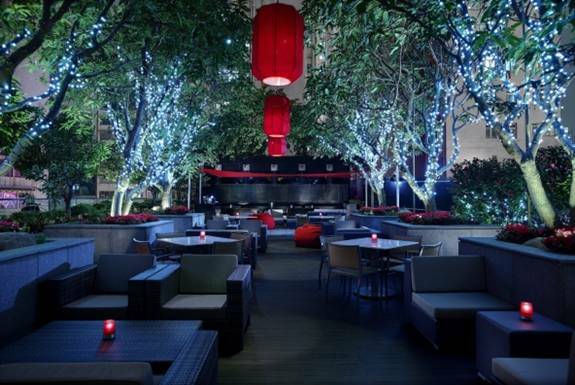 The Backyard, Langham Hotel, 555 Shanghai Street, Mongkok, Tsim Sha Tsui, Kowloon, Hong Kong. +852 3552 3388. +852 3552 3250. Serenade, 1st floor, Hong Kong Cultural Centre, Restaurant Block, Salisbury Rd, Tsim Sha Tsui, Kowlong. +852 2722 0932 Ask to be seated close to the window, as the view from the restaurant is simply great. 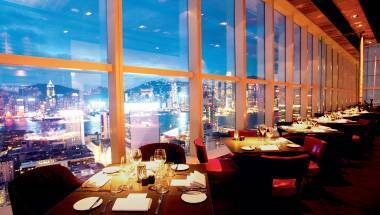 Lrge windows treat diners to the stunning views of the Victoria Harbour. Daily 9am-4.30pm. 5.30pm-11:30pm. Lobby Lounge, Intercontinental Hong Kong, 18 Salisbury Rd, Kowloon, Hong Kong. +852 2721 1211 The Lobby Lounge, with its impressive wall of windows showcasing a mesmerizing panorama of Victoria Harbour and Hong Kong Island, truly offers one of the world's most magnificent views. Harbourside, +852 2313 2323 Intercontinental Hong Kong, 18 Salisbury Rd, Kowloon, Hong Kong. +852 2721 1211 Literally located at the harbour edge, Harbourside offers all day dining in a casual and enjoyable setting, BLD. Fu Kei Restaurant, 5th floor, King Wah Centre (on the corner of Nathan Road and Shantung Street), Hong Kong. +852 2384 3388 Serving fabulous food from different Chinese cuisines. M Garden, 6th floor, Grand Tower, 639 Nathan Road, Mong Kok, Hong Kong (near the corner of Shantung Street). +852 2787 3128 Vegetarian restaurant serving a wide variety of vegetarian Chinese dishes. Oyster & Wine Bar, Sheraton Hong Kong Hotel & Towers, 20 Nathan Road, Kowloon, Hong Kong, China. +852 2369 1111. Look out on Victoria Harbour and the Hong Kong skyline. Mon to Thurs 6.30pm-1am. Fri & Sat 6pm-2am. Sun 12 noon-3pm. 6.30pm-1am. Public Holiday & Eve of Public Holiday 6.30pm-2am. Starwood. Spasso Italian Bar, Shop 403, Level 4, Harbour City, Ocean Centre, Hong Kong. +852 2730 8027. 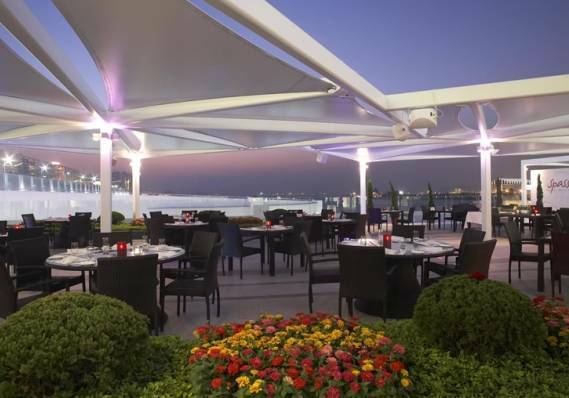 Sit on the terrace and enjoy the amazing Victoria harbour view. Le Méridien Cyberport, Hong Kong, 100 Cyberport Road, Hong Kong. +852 2980 7788 Its cocktail bar has preparations for an astonishing variety of imaginative cocktails, including the saketini, to enjoy in the terraced garden. Starwood. Sugar Bar Deck Lounge, 32nd floor, East Hotel, 29 Taikoo Shing Road, Quarry Bay, Hong Kong. +852 3968 3538. Daily 5pm-2am. Sun 1pm-11pm. Top Deck, Top Floor, Jumbo Kingdom, Shum Wan Pier Drive, Wong Chuk Hang, Aberdeen, Hong Kong. +852 2552 3331.